Location: find us at the Tennis Centre in La Manga Club. We have the only grass green in the region! Membership: Over 80 members, both resident in the Club and the surrounding area. Various abilities and a wide range of ages! New Members Welcome! We help beginners by providing equipment and free coaching. 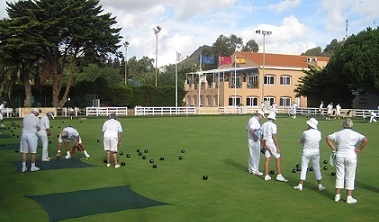 Experienced bowlers who enjoy playing on grass will find us a friendly and active club. In Winter: our main season, in addition to the roll-ups we have a wide range of Club competitions, League Matches against other clubs in the region, weekend special events and several social occasions! We cater for all levels of bowling ability - and have a lot of fun! Come and Join Us! Give this wonderful and challenging sport a try! Just contact me and I will arrange a taster session for you!